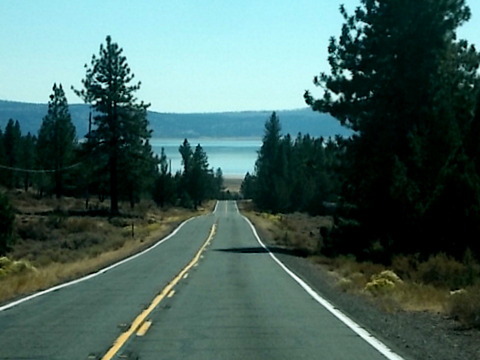 ← Goodbye sweet Oregon, California here we come! Upper Rush Creek to Eagle Lake! I don’t make a decision to break camp until mid-morning. 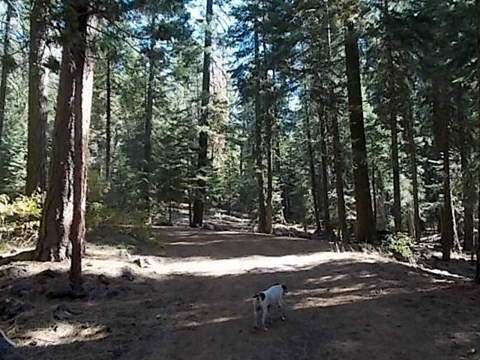 Bridget, Spike, and I are up early, wandering around the now-empty Upper Rush Creek Campground. We’re drawn to the noisy creek. The creek runs behind each campsite. I like a rustic campground. There’s something about being alone in the woods. We stop for a few minutes to let Bridget rest. 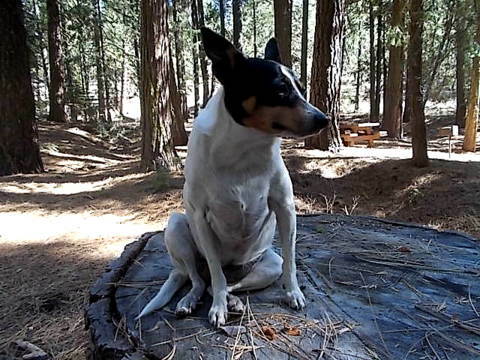 Bridget sitting on this stump is just the right height for kisses! We continue south on Rte. 299 and then take Rte. 139 past the town of Adin. 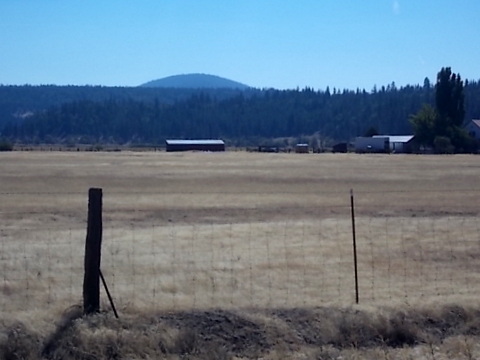 We drive across a wide valley of farms and hay fields which reminds me of Montana. Fire is a real danger with dry grass all around. Now we’re out of the valley and gaining elevation. 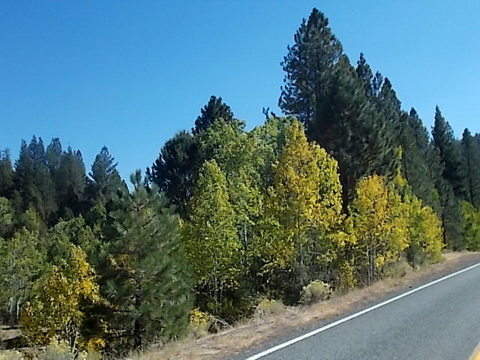 Aspens in early October brighten the roadsides. Is this why California is called The Golden State? Bright ribbons of yellow line both sides of the road for many miles. I have a great crew! Bridget and Spike know we’re moving to a new camp. They also know there’s plenty of time to nap while the PTV hums along. Eagle Lake is up ahead! At last the lake comes into view! I know of two possible boondock sites at the north end of the lake. However, I see that the lake is very low making them not very attractive. I don’t want to camp where the crew and I have to walk a quarter mile to reach the water’s edge. Hmm . . . maybe the south end of the lake is deeper. What a beautiful lake! I hope I can find a waterfront campsite. A home on the lake is nice, but I’d rather have a home on wheels. 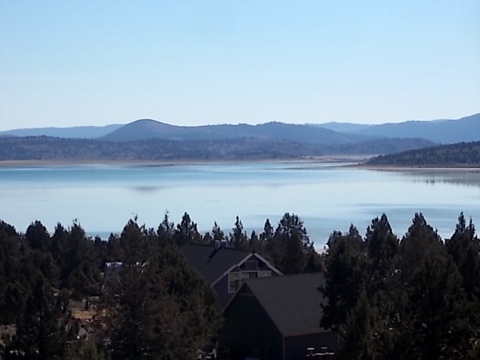 Part of the west side of Eagle Lake is open for private development. The afternoon sunshine turns the lake a lighter shade of blue. 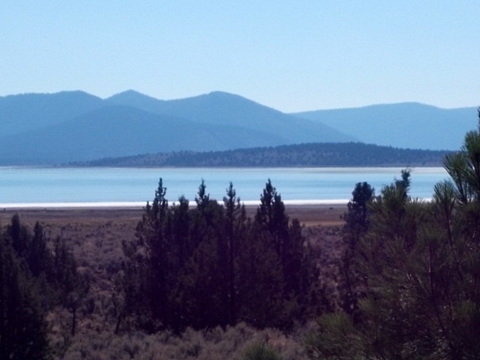 The rest is managed by the Bureau of Land Management or the National Forest Service (USDA). We pass Christie Campground which is closed for the season. The next possibility is Merrill Campground at the south end of Eagle Lake. I drive into Merrill National Forest Campground. I park at the information/self-pay station. Immediately Karen the camp host comes over to explain that half the campground is closed for the season. That’s no problem because it’s a big campground. She tells me there are three choices: full hookups, electric and water, or no hookups. I’m pleased to hear that the “cheap seats” are the best — They’re positioned with a clear view of the lake! I choose a site with only one neighbor and he’s not nearby. The Senior Pass price is $10 (no hook-ups but, good golly miss molly, look at that view!). 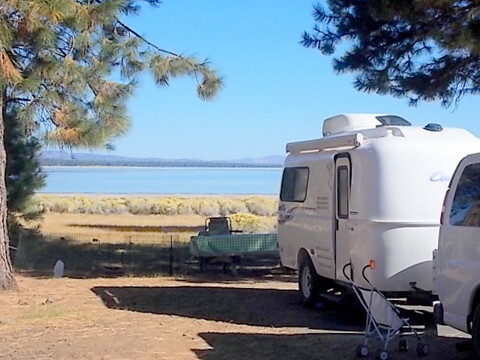 This entry was posted in Simple living and tagged aspens, boondocks, California, camping, casita, Eagle Lake, Merrill Campground, nature, RVing, Tow vehicle, Upper Rush Creek. Bookmark the permalink. 51 Responses to Upper Rush Creek to Eagle Lake! I agree…..what a view!!!!!! I love being on the shore of water. Glad to hear all is well. Love you,My Dear Sister. Yep, when your home is on wheels it can be a different lake every night. Or it could be the mountains, desert, creek, valley, hill, or dale. Your fancy, your pick! I still am overcome with wonder, just thinking of the possibilities! What a way to live . . .
I’ve never been to the area you drove through….I see in your photos it’s a beautiful country. What a beautiful camp ground you snagged. I hope to travel through there one day. Yes, what a wonderful way to live! I hope you do get to travel through here someday, Rita. Merrill Campground is top-notch. I’m going to post a slideshow of the lake and the campground. Beautiful view. Hope you enjoy your stay. I am enjoying it here. Thank you, Donna. My students and I have decided to track your movement on a big map. They thought it would be fun to see the places you visit. They know this is my retirement dream, and some of these kids have not even been out of our county. Thanks for letting us live vicariously! They are in awe that an adult woman would “leave everything” and live your lifestyle. They have been with me through my divorce and that bad year. They are just fascinated! I teach middle school READ180 (a remedial reading class) and some of my babies have been with me for three years. Plus, they see I am not alone in my craziness! Ha! I ran away from home! Gosh Sue, what resources do you use to find your campsites? This one I found by putting rubber to the road! I saw a bunch of tent symbols (which indicate campgrounds) on my Benchmark map, they were clustered around a lake, so I went and took a look. The first one was closed, the second one… bingo! 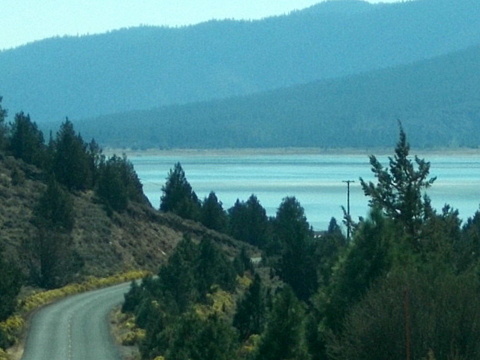 Here is a nice online camping resource .The link is zoomed to eagle lake area……….. The Montana you were in is now being covered by snow and low temps. We might have our first hard freeze this weekend. Got the RV anti-freeze put in to the water lines today. Eggie is ready but not me. Love the Indian Summer days. Love your pictures and Crew stories. Oh, almost at my target weight – been taking it slow and enjoying some new type of foods. Good for you, Emily, on the weight loss, not the cold. I let myself drift away from Dukan. I’ll be back on it soon. It’s nice to know a diet that actually works. Ok, you Dukan experts; Why no carrots? Carrots turn to S U G A R.
Maybe that’s why I like them, LOL. Do you think raw carrots turn to sugar?? They have so many vitamins, etc in them…I knew the cooked ones turn to sugar…but thought the raw ones were ok…what do you know of that?? You’d have to eat 3 lbs. of carrots (raw) to equal the sugar content of a 20 oz. Coca-cola. I think the Dukan diet doesn’t include carrots because it’s a diet based on eliminating cravings for carbs, sugars, and fats. So keep eating your carrots, Elizabeth! Heh…we do not eat them a great lot….we have diabetes so are working on avoiding carbs so much as we can, etc etc….thanks for reply. Nice campsite……………love sites that are near a river or lake. The sound of a river is oh so soothing. Is it beginning to get chilly at night? Hey Bridget…..glad to hear you’re on the mend. Take it slow…girl! Glad you had a good soak Mr Spike. Does the BLT have an outside hose in case you have to wash off Mr Spikey? Yes, the BLT has an outside shower. Fortunately, both Bridget and Spike are self-cleaning. What I mean is… once they dry, the dirt falls off their fur. . . usually. The chilliest nights so far were the last few nights at Natural Bridge. Now we’re further south and lower in elevation… very comfortable sleeping weather. I wondered what that is. I noticed it was growing along roads but not where livestock graze. Your observation is rather counterintuitive to what Carol posted unless all the grazing livestock were sheep and goats. I really like the first picture you posted of the forest. Pretty neat to be there without a lot of people around. It’s nice to see the changing colors of fall. I bet that water is freezing!! 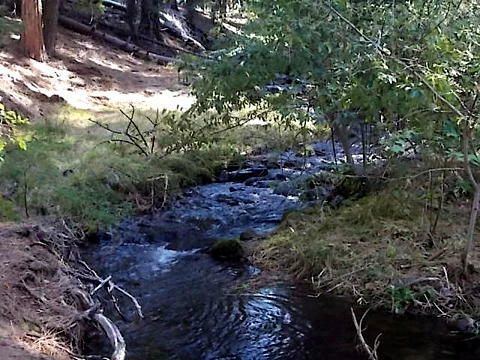 The water in the creek is cold, but not as cold as the water Spike jumped into from the Blue Blob (Williamson River). Not only wasn’t there a lot of people around, there were NO people around! You said “NO people around “ boy I know that “Angst“ feeling first hand. It can be strong but always fleeting , plus you have the crew and tons of online friends to keep you company….hey you’re famous aren’t you ? You’re baiting me, right, Mark? You know I feel no angst at the absence of people. I’m in heaven alone in the woods. Nope, we’re not known as the Golden State do to those yellowy roadside plants, but rather because of all the wild oats all over the state. When looking across a meadow, field or whatever, it looks like “amber waves of grain”. Then, hummmm, it might be 1849 when “gold” was discovered here in my foothills. Probably all of the above . . . When your house has wheels it can be a cabin in the woods, a house at the lake a cottage at the seashore where ever you go your home. And if you have wonderful travel companions like you life can be pretty darn good. Happy trails to you to, Sra. Julia. Your comment says it well. 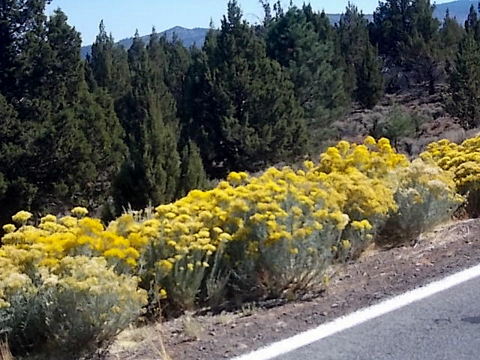 Well, I am not an expert, but as a Native California girl, I THINK maybe California is golden in part due to the gold rush days and also the state flower used to be the poppy…and some of them are quite golden too…I too love the quaking aspens in N. California!! Well, we just got home from our recent trip up to VA again to search for a spot to land for a few months!! We are awestruck at what GOD has provided!! A barn apt (the fanciest barn apt I ever heard of, and fancier than any home I have had) but better than that is on 280 acres or so….lovely spot in the trees!! We really liked the owners…so I think our next 5 months there or so will be peaceful and quiet and lovely!! We are so grateful!! Hubby found it quite by “accident” on Craigslist in a very small catagory we had never looked at before. While we will not be camping as you are…in a way, it is sorta camping!! NOW, if I can safely manage the flight and a half of stairs to get up to the apt!!! Sounds wonderful, Elizabeth. 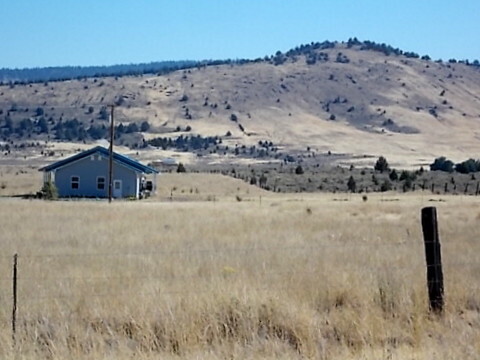 I’m very happy for you… 280 acres… Wow! Loved it, as always… You enrich my evenings when I can get a Mifi signal. Someday, ah, someday, all this struggle for internet connections will be a relic of the past. You write such nice comments. We’ll be taking Rte. 395. I think we’ll head east on I-10 . . . Of course, I may change my mind at any point! I think you will love I-10! Looks like another great spot to spend a few days! This is why I hurried out of Williamson River Campground. I wanted to have time to camp at wonderful surprises like Merrill Campground! You make me think of an observation I made earlier today. Merrill Campground doesn’t have many campers here, yet, one would think someone would go out on the beach at some point. The beach is deserted. Good for me! A loss for them! They’re all holed up inside their campers, except for a few fishermen who go out in the early morning or after sunset. 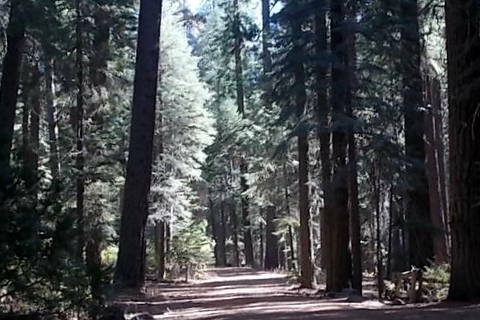 If anyone comes out, they walk or bike on the paved roads of the campground.